101 Verses that Stick for Teens based on the NIV Teen Study Bible by Zonderkidz was published by Zonderkidz in June 2012 and is our 37675th best seller. The ISBN for 101 Verses that Stick for Teens based on the NIV Teen Study Bible is 9780310729013. Be the first to review 101 Verses that Stick for Teens based on the NIV Teen Study Bible! Got a question? No problem! 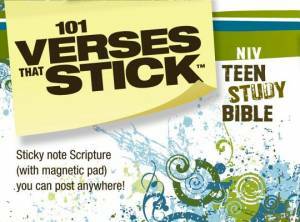 Just click here to ask us about 101 Verses that Stick for Teens based on the NIV Teen Study Bible.